Family Story Time, for all ages up to grade 6, is on Monday evenings from 7:00 p.m. – 7:30 p.m. Children may wear pajamas if they wish as they enjoy stories, rhymes and music! Little Listeners Story Time, for children ages 3-5, is on Wednesdays from 10:15 a.m. – 10:45 a.m. and features lively tales and participatory activities. Tyke Tales, for children ages 0-18 months, is on Thursdays from 10:15 a.m. – 10:35 a.m., followed by a short playtime. Tots & Toddlers, a sprinkling of stories, songs and laughter for ages 18 months-3 years, is offered on Thursday mornings from 11:15 a.m. – 11:45 a.m. Simply Stories is for all ages and is held on Fridays from 10:30 a.m. – 11:00 a.m. It is designed to emphasize books and the arts of reading and storytelling. Kids are welcome to bring a friend and enjoy listening to stories! These sessions are also designed to inspire an appreciation for the library’s wonderful collection of children’s books. All ages are welcome, but the interest level may be from ages 3-8. 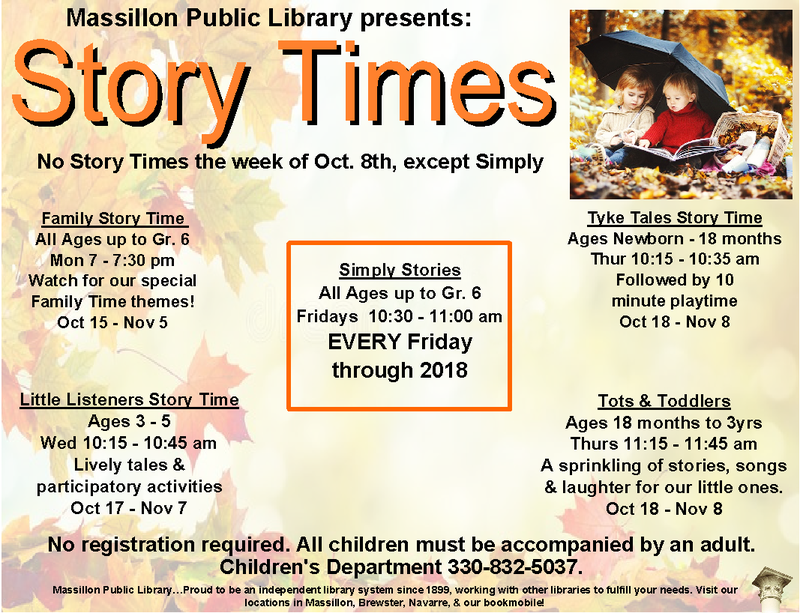 The current Story Time session will run from October 15th through November 8th, except Simply Stories which runs continuously and is scheduled every Friday until the end of the year. All the story times reflect the early literacy initiative, Every Child Ready to Read, offering parents many fun and useful suggestions to help their children gain the early skills that lead to reading. Children attending these free programs must be accompanied by an adult. One child per adult lap, please. No registration is required. For more information, contact the Children’s Department at 330-832-5037.